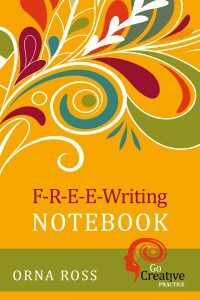 What is f-r-e-e-writing? In school, we are taught to write to communicate with others – our teachers and examiners, mainly. But a number of psychologists, scientists, behaviouralists, healers and educators are increasingly interested in the astonishing power of writing when we use it to communicate with ourselves. It is no coincidence that in my novels both Jo and Norah in After The Rising and Mercy in Blue Mercy write their way to resolution. This is my small tribute to the power of writing to heal, transform and liberate. Writing is such a miracle – through marks on a page, we can communicate across vast continents and dead generations – but like all the everyday miracles, we tend to take it for granted. Writing is the uniquely human experience. Dolphins, birds and other species can communicate but only we can write. It is also the human achievement that (literally) underwrites all the others – without it there would be no mathematics, no science, no philosophy, no history, no cinema. And, of course, no literature. Equally miraculous, I believe, is the power writing-to-self has to expand and deepen our creative capacity. My reserach into this topicin this has led me to the technique I call F-r-e-e-Writing, a particular method that I believe maximizes creative flow and effectiveness. When f-r-e-e-writing, we always write as fast as we can. F-r-e-e-writing is also timed. You set a timer or a page count and just do it and when the time is over, or the pages are full, you stop. Full details in this F-r-e-e-Writing Tutorial. If you’ve never done f-r-e-e-writing before, or if you haven’t done it for some time, or if you’ve done a different “writing-for-self” method, like Julia Cameron’s “morning pages” or Natalie Goldberg’s “writing practice”, begin again. Try it and see how you go. The most important thing about any form of freewriting is not what method you use but that you just do it. For f-r-e-e-writing to work its magic, it has to be experienced. Don’t content yourself with reading about it. Or tell yourself you did something similar before, so you know all about it. The simple addition of speed is enough to change the experience radically for most people. And the benefits are cumulative. They build over time. it’s about showing up, showing your creative self that it is valued, that you want to hear what it has to say. 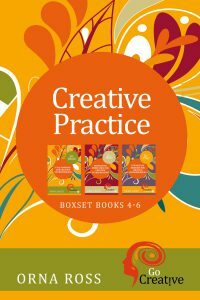 F-r-e-e-writing is a core creative practice and Book 4 of my Go Creative! 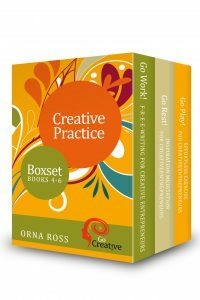 in Business series is a in-depth guide to the practice. You can Pre-order Book 1 here. Our lives are so noisy and distracted these days. F-r-e-e-writing is a way to connect with the deeper, more centered and connected, self. Using this method the aim is to write fast enough, for a set period of time or number of pages, to get beyond our censoring, conscious minds and access subconscious levels. I’ve introduced this easy writing method to writers and other artists and emerging artists but also to postgraduate students and returners-to-work, to immigrant groups and women recovering from drug addiction. I’ve witnessed its benefits among people from different countries and at every level of social and personal development, even those with weak literacy skills. That’s why I can teach the same simple technique, over and over, without ever tiring of it. The more I teach it, and hear the stories of lives transformed by it, the more my respect for the complex potential of this simple technique grows and deepens. I’ve come to see f-r-e-e-Writing not as a luxury for those with the time to do it but a simple, significant shortcut to physical, emotional, spiritual and creative wellbeing. A daily brushing of the psyche, that takes a little bit longer – though not much – than a good brushing and flossing of the teeth. I have come to believe that everybody who can be, should be, f-r-e-e-Writing. This is especially true for those who want to consciously create: writers and composers and filmakers and artists of all kinds; healers, educators, activists and coaches. Also also creativists, those who bring conscious creation to work, money, relationships, every aspect of life. F-r-e-e-Writing clears. Sometimes, yes, we may be overwrought in our F-r-e-e-Writing. Or whiny or irritable or sad or angry or miserable. Or joyful or elated or carefree or blissed out. Over time, all our emotions will find their way in and we come to see how transient they are. Allowing all the “negative” emotions, ideas and feelings within us and giving them free vent in our notebooks, siphons them off. This greatly lessens their hold on us. This is why some people see F-r-e-e-Writing as a form of meditation. F-r-e-e-Writing liberates. We come to see that it is not the events that happen to us – as individuals or as artists – that count, so much as our inner relationship to those events. Regular F-r-e-e-Writing ensures we become a channel for the deep stuff rather than a mouthpiece for con-mind moans, sound-offs, rants or self-indulgences. We acquire the distance that is a prerequisite of ease, freedom and flow, the defining qualities of the create-state. F-r-e-e-Writing Stabilises. Truly allowing all the voices inside diminishes the power of any one (I’m thinking of the inner critic). Regular and committed use of F-r-e-e-Writing generates a progressive strengthening of the psyche. F-R-E-E-Writing inspires. As you F-r-e-e-Write, great ideas emerge, seemingly from nowhere. F-r-e-e-Writing empowers. F-r-e-e-Writing teaches us to trust our own experience and interpretation of the world, essential to a conscious creator, together with the confidence to express what we truly feel and what we truly want to create. PLEASE NOTE: You can purchase a F-r-e-e-writing Notebook with full instructions through Amazon.